One of the downsides to technology is the hold it has on us at times. You see people walking down the street checking their phones oblivious to the world around them. Or how about those people sitting across from each other at a restaurant on their phone, completely absent from their potentially beneficial physical experience? The phenomenon has actually made driving less safe, in fact the CDC reports that 9 people are killed and 1,000 injured each day in the US involving a distracted driver, a growing number of which involve cell phone use. There is a very strong neurological case for why we feel so inclined to review and respond to each of these inbox/social media stimuli – a hit of dopamine. So that’s why our inbox is sacred ground, and we need to re-claim it. 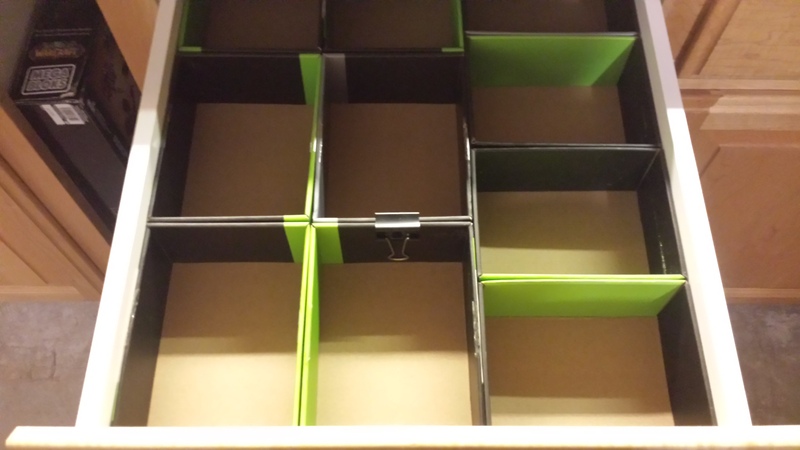 We can no longer blame OCD or some work obligation. We need to become present, and claiming your inbox is one way to get there. Context is important, to clarify this is written by a Microsoft Outlook and Google Android guy. Many of our peers are using the latest iDevice and Google Apps. So your solution may need to be different from mine but philosophically and scientifically it could be the same. Focus on single related tasks, humans are terrible at multi-tasking and changing from one activity to another frequently. Get as many things out of my head and stored in a logical and easy to access way. Limit stimulus that had a dopamine loop, distraction – dopamine – distraction – dopamine – distraction – dopamine. Now that we know why, we will have to save much of the “how” for later, because it would be more of a series of blog posts. For now let’s focus on how your Email inbox became a key battleground for all three of these items. 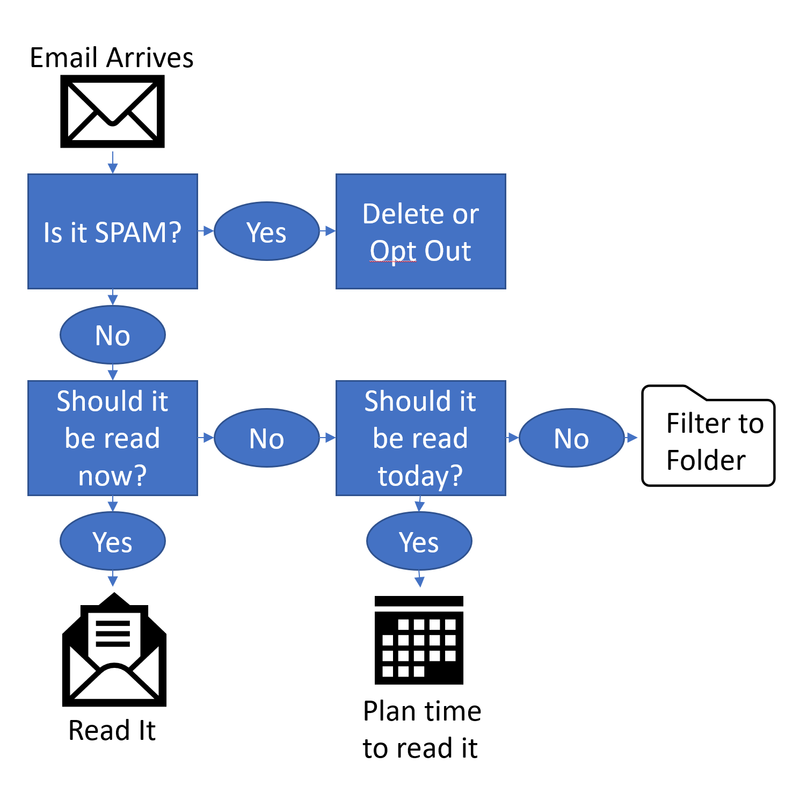 My easy to follow flowchart for Email processing. Ensure that your email provider offers great anti-spam service. Create folders and rules to sort messages to them based on organized criteria. Now let’s see what it looks like to address those steps, one at a time, and work to reclaiming your inbox. Consider a change, test out a new provider, see how they handle your messages, you can forward your old address to the new one and get an idea. White list your friends and any domains and Email addresses that you want to make sure you receive messages from. Black list any you discover that have nothing positive to offer and never will. Hopefully you can get spam under control, if not then maybe you need a more intensive solution. Do not accept less, life is too short to waste away droning away sorting and deleting useless Emails. Having been in the IT industry for much of my career this has been paramount to effectively using Email in business. It seems obvious If you didn’t sign up for something or aren’t interested (or will never read it! ), request to be removed or use the unsubscribe option. An alternative to unsubscribing is to black list the domain. It seems harsh but that is often the best way to go particularly if you feel the senders organization has nothing positive to offer. In some cases it is faster to just blacklist. Over time you will start to get a feel for which companies to make a legitimate attempt to reduce and which ones need the nuclear (welcome to my blacklist!) option. All of these items have their time and place, but not when you are fresh and capable of your best work. That’s when your sacred ground is most sacred, reclaim it and perform at your top level for the things that matter most to you. In the next step we’ll review how to automatically get content into these folders so it bypasses your inbox. Update an existing rule whenever possible rather than adding a new one. Be prepared to use a separate rule to move back certain items that might match another rules criteria but should be in your inbox. Be clever and unafraid to learn, rules are extremely powerful, you may find uses for them that go well beyond what is talked about here. Another bit of neuroscience to keep in mind is that it can take a while to form a habit but once you do it is difficult to undo. Use this to your advantage, form a habit of being diligent about performing the positive tasks related to the reclamation of your inbox. Embrace the dopamine your brain likes doing things that serve you, your family and your customers best. 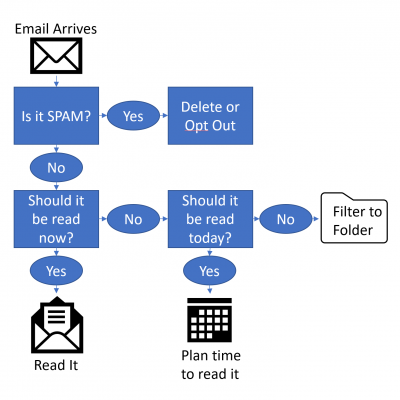 Don’t stop performing that simple test when you see something new in your inbox and decisively deal with it or save it for a time where you can handle a group of them together.